One Night Band. Saturday, August 29th, 8 pm at the Middle East Up Down! Go. A few weeks ago, I wrote about the new bio of Sonic Youth and I commented that one of the striking things about them was how embedded they were in their community, the 1980s New York art-music scene. And Cory Doctorow made the point that, in an age of all creative works being just a click away, only relationships aren’t fungible. 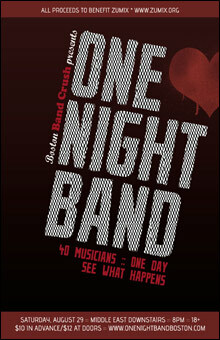 So I’m really intrigued by One Night Band, a music event organized by Boston Band Crush. The deal is that 40 people from local bands get together at the godawfully early hour of 10 am on Saturday, are randomly assorted into eight bands of five people, and then scatter to rehearsal spaces all over Boston. The mayfly bands have to write and learn three original songs, and rehearse one cover, before they present themselves at the Middle East Upstairs Downstairs, ready to rock. One of the neat things about this format it is how it allows for the cross-pollination of local music fans – with any luck, it’ll draw a superset of the followers of all the participants. Read more about the event here, here, or here, and check out Boston Band Crush’s wall-to-wall coverage of the participants. The z=z award for most honest comment goes to Henry Beguiristain of Aloud, who wrote: Am simultaneously frightened by and looking forward to One Night Band this Saturday. Should be fun and/or horrible. Of course, One Night Band as part of the development of a local community in the digital age is only part of why I’m going – I’m also hoping to see some trainwrecks. EDIT: No one is so wrong as someone who is absolutely sure they’re right. It’s at Middle East Downstairs, not Upstairs. Which means that there’ll be more room for you!